Global Robotic Process Automation (RPA) market is expected to surpass USD 11 billion by 2028– with a forecast growth of 30% between 2018 and 2028. In the last two years, there has been impressive surge in RPA deployment across worldwide. The trend is quite strong in Europe and North America. Increasing digitization and higher integration of internet of things (IoT) has created favorable ecosystem for industry vendors. The tool not only helps in lowering the operational cost but also enhances return on investment (ROI) through automation. As per the estimates, companies are able to save over 70% operational cost through RPA. Much of the usage of RPA is expected to be seen in business process management and will account for 35% of total share by 2025. 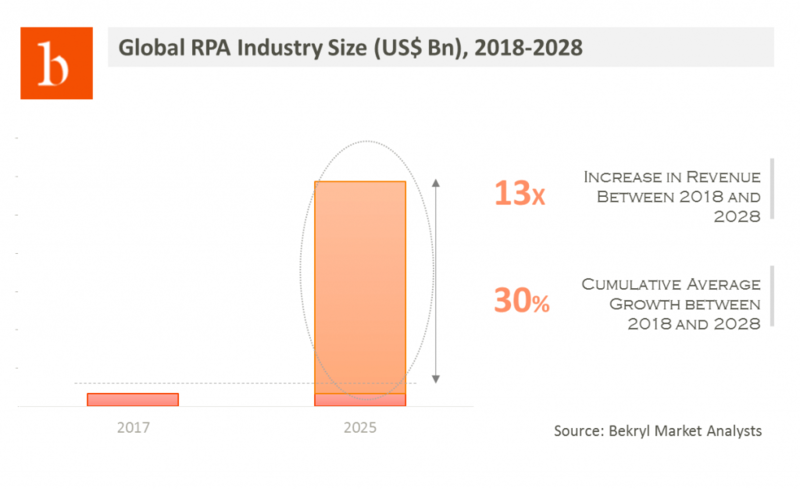 Request Global Robotic Process Automation Market Sample Report: https://bekryl.com/sample/sample-request/?bekryl=Get-Robotic-Process-Automation-RPA-Sample-Report. North America will account for over 58% of global sales in 2018. Higher spending on R&D along with high level of automation has created favorable business environment in the region. It is expected to continue its dominance before losing market share to developing regions by the end of forecast period. While the industry is set to register impressive growth, resistance from internal IT companies along with unclear model on Total Cost of Ownership (TCO) are key challenges faced in the region. Western Europe will be another key destination for vendors. The Region is characterized by the presence of well established companies. Jacada Inc., Be Informed B.V., UiPath, Blue Prism Group Plc, Automation Anywhere Inc., and OpenSpan are key players with Automation Anywhere being the market leader. Germany accounted for 28% of regional share and will witness 2X increase in revenue by 2023. Over 85% of companies are expected to use RPA for operational efficiency in Germany by 2023. Much of the robotic process automation will take place in large scale enterprises. High capital influx along with in-built IT infrastructure are key factors driving the installations of such software in organization. These leading organizations spends nearly 250X higher amount on automation than that by mid-scale companies. High security features, lower turnaround time along with faster technology adoption has led to wide scale RPA demand from BFSI and IT sector. RPA eases the IT infrastructure setup in BFSI sector and prevents fraudulent activities – thereby ensuring high level of security, better customer engagement and good profit margins. The system bridges the gap between BPM and ERM systems. Each year, the banking sector spends nearly 18% on IT infrastructure and security maintenance. Installation of RPA will help minimize such spending to large extent. Be Informed B.V., Blue Prism xGroup Plc, Automation Anywhere Inc., Jacada Inc., and OpenSpan are key vendors covered the robotic process automation market report.